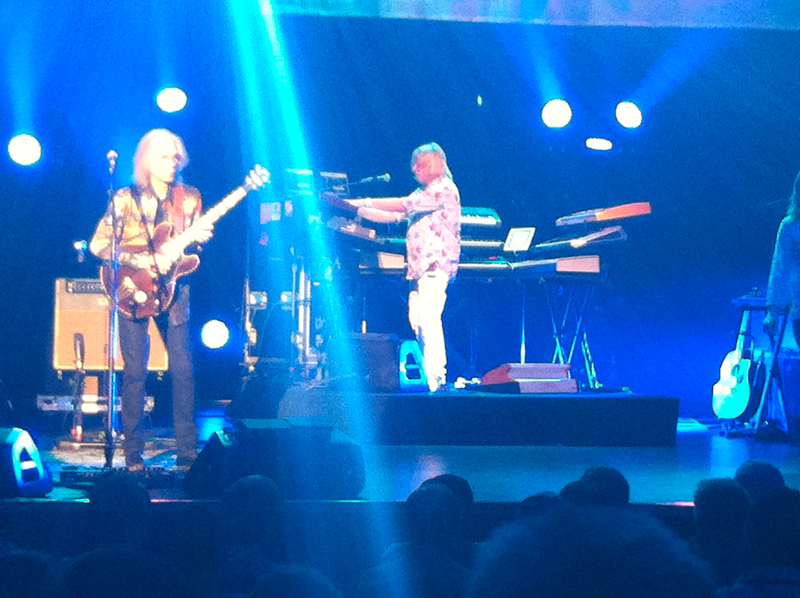 A couple of nights ago, I went with my older son, Nick, to see Yes, in concert. Yes was super-popular in the 70’s and 80’s. I remember them being one of the staple groups my crowd always listened to. In fact, I can specifically remember listening to “Roundabout” up on Harris Field in the Bronx, my senior year of High School. I wasn’t really expecting much from the concert. I mean, I liked Yes, but I wasn’t a raving fan of theirs or anything like that. Like I am with lots of bands I go and see. But let me tell you what — it turned out to be one of THE best concerts I’ve ever seen. For starters, Ruth Eckerd Hall is just a very well-designed place, acoustically. In fact, it’s one of the best I’ve been in. Second, the band was SO incredibly well-rehearsed, throughout the entire show. They even did some old-school stuff — they had a very cool, MASSIVE wide screen behind them. And throughout the concert the screen was filled with psychedelic pictures and movies and all kinds of interesting graphics. Then, at the end of their show, they blew up like a TON of confetti, which landed all over the first 40 rows or so. Plus, they played for 90 minutes, took a 20 minute break… and then came back and played for almost another hour. And of course, they came out and did “Roundabout” for the encore. Honestly, I’ve probably been to 50 concerts or more, and this was one of the best ones ever. And of course, it was great to see the show with Nick. We’ve gone to loads of shows together in the last 10 -12 years. He was definitely the youngest person at this show. In fact, I was one of the younger people at this show! The best part of the night though, happened before the show, actually. I had been out at the gym, and when I got home, Nick was there waiting for me. (He lives on his own, with his girlfriend.) He was out back, sitting in the sun, and I went out there and bent down to give him a hug. And he came over to me and gave me a big bear hug, which we both enjoyed. It’s funny… raising children is difficult, by anyone’s standards. And frankly, many days… it’s NOT a very rewarding job. However, now that my oldest son is on his own, and getting older (almost 23)… I’m finding, the rewards are coming, much more often. And, in ways I absolutely never expected. Oh, by the way, I added some more ads to the Offbeat Ads section of my blog. Check ’em out if you get a chance and if you want a good laugh.